Here’s another guest post from Allison Taylor at Wolfram Research. We’ve seen sous vide applications before – but we’ve never seen one that uses the Wolfram Language and Mathematica to describe elegant curves while it prepares your dinner. Thanks Allison, and thanks to Diego Zviovich, who came up with this project. 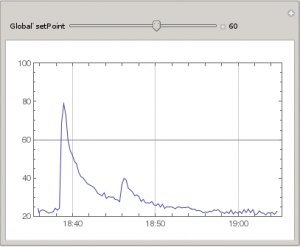 Diego Zviovich, another one of our ambitious power-users of Mathematica and the Wolfram Language on the Raspberry Pi, has managed to (affordably) master the science of sous-vide cooking! For those who aren’t familiar, sous vide is a modern cooking practice where the food is first put into airtight bags and then cooked in a water bath at a very precise temperature. The result is perfect, evenly cooked meat or fish, with much greater penetration of flavours from any marinade you might be using. Actual sous-vide cookers cost hundreds (or thousands) of dollars to buy, but with a few sensors, a crock pot, and your Raspberry Pi with Mathematica installed, you can create your very own sous vide at a fraction of the price! The 5V 2-relay control module will be used to control the power to the crock pot. We’ll be automating this switch to turn on and off depending on our thermocouple readings, maintaining the appropriate constant temperature that we want. A walk-through for setting up a circuit and connecting the relay from your crock pot to your RPiPi can be found in this handy YouTube tutorial. In order to get the temperature readings using thermocouples, we’ll need to set up an analog-to-digital converter—since the GPIO on the RPi does not have analog pins. A wiring diagram for the MCP3008 can be found here. Once you’ve decided at what temperature you want to cook your food, you can conduct a simple experiment to determine the ideal fixed resistance value that you will need to effectively maintain it. 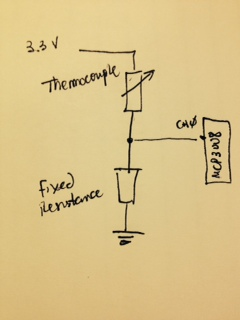 Using your thermocouples, a regular thermometer, a voltmeter, and three glasses of water—one iced, one warm, and one hot—take three temperature measurements and three resistance measurements (one from each glass of water) and fit the data to a curve using Mathematica. The model above fits very well (R^2=.998), so we can use the curve to find the expected resistance at our desired temperature. For this example, let’s say 60 degrees Celsius. 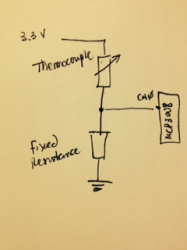 From these results, using a 56K resistor for the thermocouples will provide the appropriate temperature range we need. And now we can open up the Wolfram Engine or Mathematica and build the sous-vide program! Check out Diego giving a demo of the program and relay controller! Also, if thermocouples aren’t your thing, you can alternatively get your temperature readings using a waterproof digital temperature sensor and following this lovely setup tutorial by Adafruit. That’s fantastic. I’m planning on tackling a technically similar project, using the Compute Module to drive a surface mount oven (ex-toaster oven variety) that’s controlled through a web server to allow a user to select profiles and view (and log) reflow metrics etc through a browser. This project gives me more than a good starting point for the software, great job Diego! Look forward to trying out the Wolfram demo. I want a temperature controlled coffee mug! Uhm.. just to clearify, don’t you mean a thermistor instead of a thermocouple? They are very different animals, and you can not use a mcp3008 to read a thermocouple. Thermistors only go between -50 to 200 degrees C. Thermocouples go from -200 to 1400 degrees C.
Hope you don’t mind me asking (I’ve not used Wolfram, so can’t tell exactly what the code is doing), but other than the pretty graph is this doing something that you couldn’t do with a simple Python script? 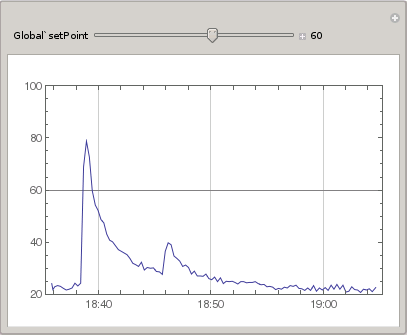 I think you are right at the moment (although the thermistor curve fitting is much more elegant in Mathematica). Where I hope the authors are going is to model the temperature response of the food in response to the water temperature, which will be a lot easier in Mathematica. Using simple thermostat on/off code and a crock-pot, I wouldn’t call this sous vide cooking. It my experimenting while making my sous vide setup, my crock-pot had a 10+ min delay between switching the element on and seeing a temperature change. Thus, the water bath temperature would probably overshoot/undershoot a lot with this setup. A PID loop would be much more ideal, and a rice cooker (which I now use) responds much quicker to inputs. Agreed Jeff, the simpler the device the better, some crock-pots are far too complicated for their own good. May I also add that professional sous vide machines also stir the water to ensure even temperature distribution. This couple be achieved with a small impeller submerged in the water bath. Two includes missing in adc.c, probably stripped by the CMS software because they’re between characters. I guess mcp3008.h and gpio.h? Ah, there you go. I wrote: “between *less than* and *greater than*” but those got stripped as well. I thought spaces around them would avoid it. Probably best to give the post/comment processing code a look-over!